A longish snippet today, just to give you some context for the point. David and his men returned to their home town after several days marching, and found that the Amalekites had destroyed it and made off with all their wives, children and livestock. They set off in hot pursuit, but some became too tired and stopped along the way. David and the remaining 2/3 of his army were victorious, and we pick up the story as they were on their way home. 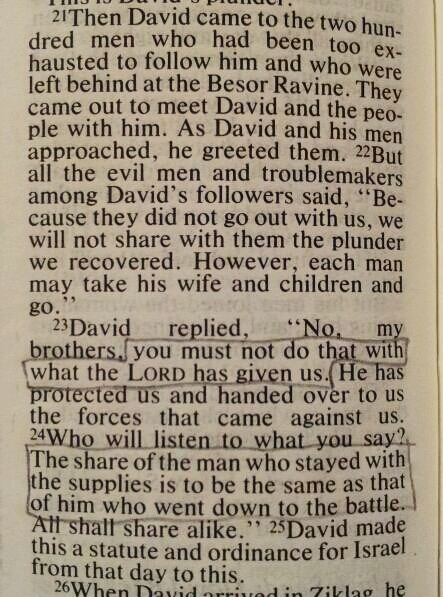 What stands out to me is the difference between David’s perspective and that of the ‘evil men and troublemakers’. They had a works-based approach to life; David had a grace-based one. David recognised that he had not earned the plunder any more than the men sitting behind at the ravine had. If God had not been with them, no skill, might or expertise would have been sufficient to bring them victory. Yes, they had worked hard, but their success was still a gift from God. Last week I wrote a piece for the Evangelical Alliance about generosity, and I wish I’d remembered this story then, because it’s a perfect illustration of the heart-change that I think is needed in order to live a truly generous life. David had it, and I’m doing my best to seek it. 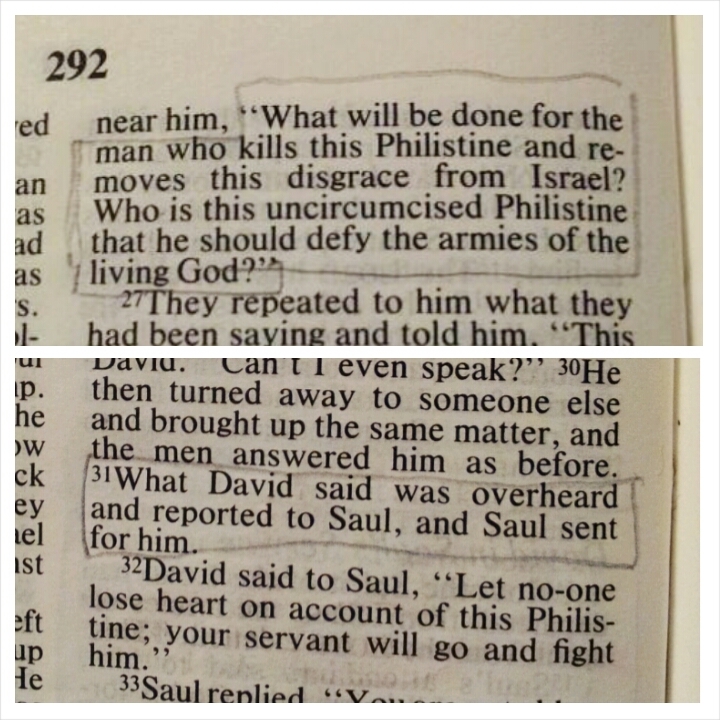 This is the second time David has had the opportunity to take Saul’s life and enter into the promises God has given him. 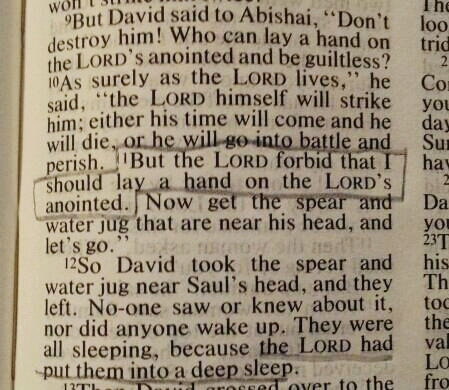 The end of verse 12 makes it clear that God was in control of this opportunity; he had put Saul and his men into a deep sleep – including, presumably, whoever was supposed to be on sentry duty! Yet David didn’t say ‘Today the Lord has given my enemy into my hands and fulfilled his promise to me.’ Instead, he used it as an opportunity to demonstrate his faith in God’s timing. 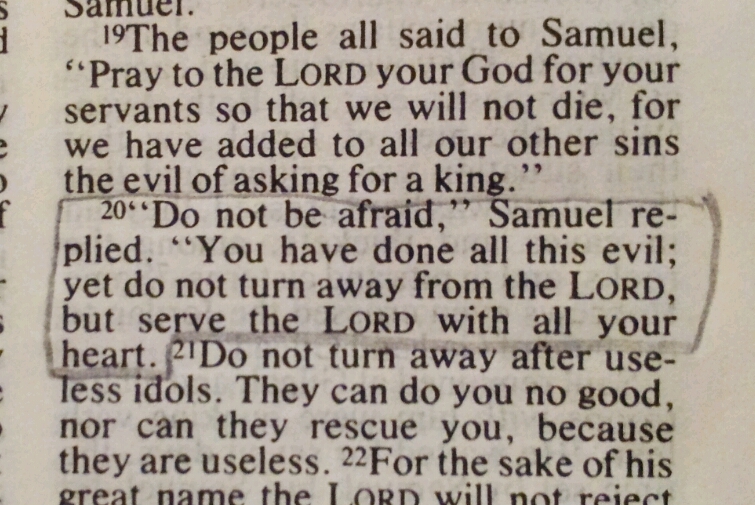 I think this is an example of David’s deep relationship with God – the text doesn’t make it explicit, but it seems David knew how to interpret the situation he was in when either interpretation would seem to be valid: this could well have been God’s way of fulfilling his promise to David and putting him on the throne, but somehow David knew it wasn’t. We too need to be so attuned to God that we know which opportunities are the ones we should take and which are distractions leading us away from God’s will, even though they may at first seem to be the fulfilment of it. This has to be a contender for the least reassuring invitation ever, doesn’t it? It’s rivalled by Paul’s comment to Timothy that, “everyone who wants to live a godly life in Christ Jesus will be persecuted” (2 Timothy 3:12), and of course by the words of Jesus himself: “In this world you will have trouble…” (John 16:33). David obviously wasn’t able to say that, but he did have the confidence that despite the hardships, danger and fear he faced, he was in the centre of God’s will, and that was, and remains, the safest place of all to be. 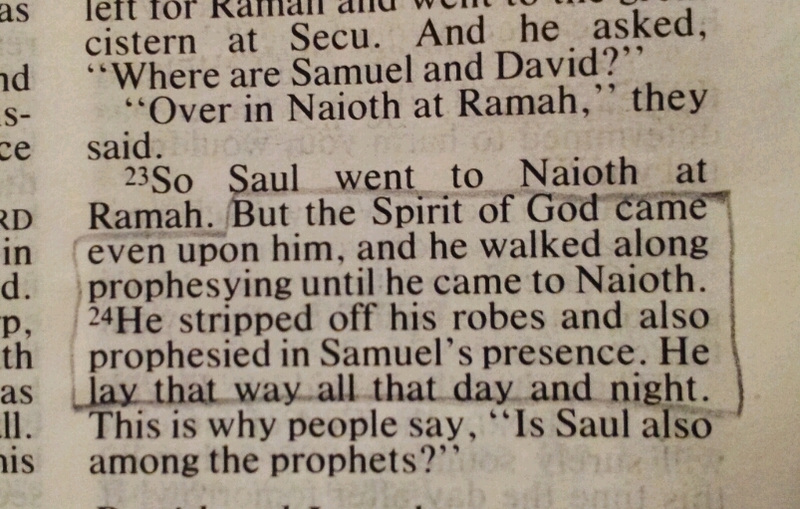 I love this: ‘What David had said was reported to Saul’, but David hadn’t ‘said’ anything, as such – he hadn’t been making statements, but asking questions. Sometimes it is simply asking the right questions that unlocks the door to the next step of God’s plan. We don’t have to tell people what we can do or nag them or berate them about what they should do, but simply ask. Not so much a snippet as a massive great chunk today. I was listening to a sermon last night that, among other things, talked about not striving and trying to do things in our own strength, but trusting God to bring about the apparently-impossible. What a great example this is of that. 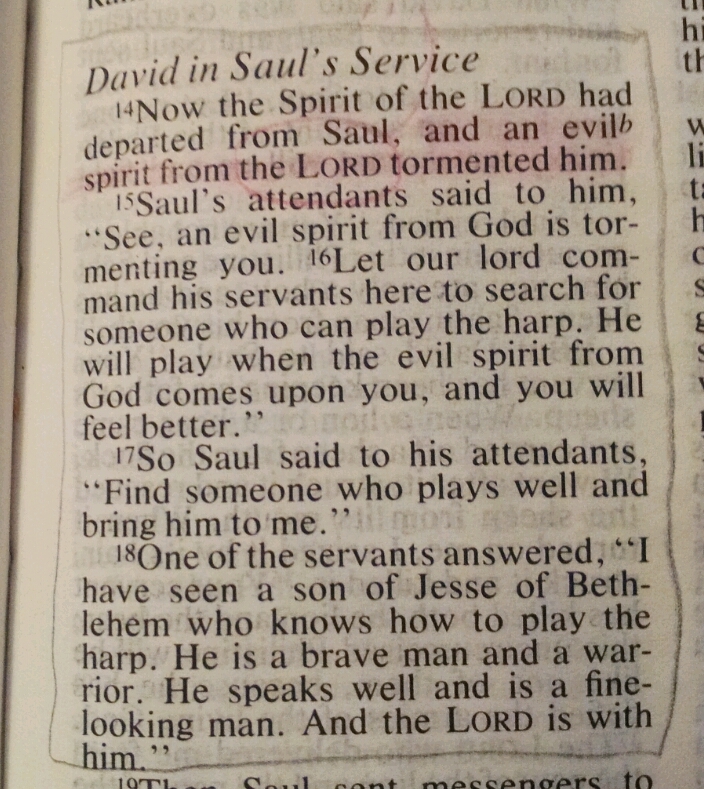 I can’t get my head around the idea of God sending an evil spirit, but whether he sent it or allowed it, the outcome is the same: Saul becomes tormented, his servants suggest a harpist (which seems fairly random), he tells them to find him one, and one of them just happens to be aware of David – a kid of no consequence who spends most of his time in the fields outside Bethlehem. And so, David gets brought into the courts of the king and presumably gets a chance to learn some of the ins and outs of running a kingdom long before God places the job into his hands. Amazing. God is much better at directing our paths than we are. Our task is simply to follow in obedience. Another wonderful example of a great follower. The task seemed hopeless – two young men, with only one sword (see chapter 13), fighting uphill against a well-armed enemy outpost – yet Jonathan had inspired such loyalty and trust in his armour-bearer, that he was willing to follow him unquestioningly. 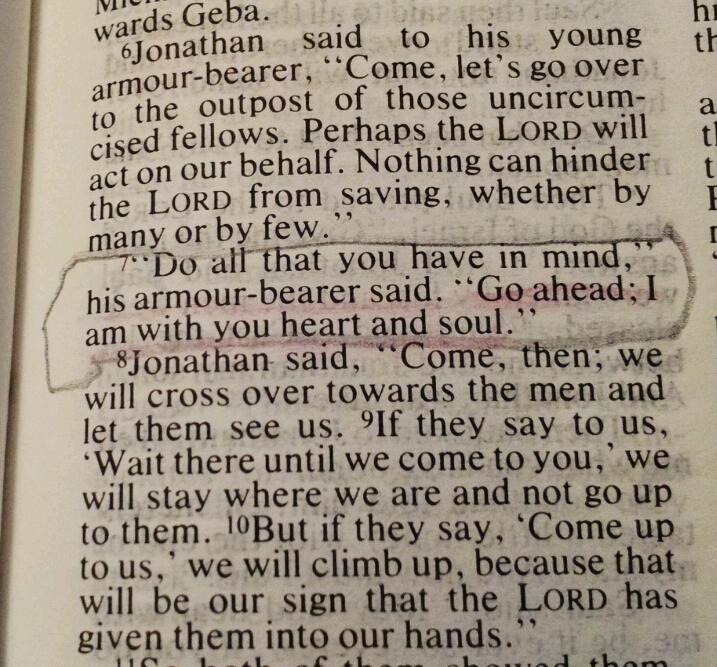 If God could give victory to two young men, I’m sure he could have given it to one, but how much more confidence must it have given Jonathan to hear those words?